Although ‘King Henrik’ Lundqvist is still under contract with the New York Rangers for two more years, fans are wondering if he’ll abdicate his throne before the end of the 2020/21 NHL season. The veteran goaltender just climbed into sixth place on the league’s all-time wins list with his 446th career regular-season victory on Jan. 18Th, but how much has he got left in the tank? The native of Are, Sweden turns 37 on March 2nd, but the Rangers are in the midst of a rebuild and that typically means a youth movement. Lundqvist will end up in the Hockey Hall of Fame one day as one of the best netminders to ever play the game, but it’s still obvious he’s not the same goalie he used to be. Yes, he’s been invited to the NHL All-Star Game and can still compete at the highest level of the sport. His career’s certainly not over by any means, but is he more valuable to the Rangers between the posts or on the trading block? Lundqvist’s a living legend in the Big Apple and is generally recognized as the best Rangers’ goalie ever and perhaps even the club’s best player period. It’s remarkable what he’s achieved so far during his stellar career considering he was drafted in the seventh round with the 205th overall pick back in 2000. But we’re talking about professional sports here and that means loyalty is often non-existent. With the Rangers likely to miss the playoffs for the second straight season there’s not really any need for a Hall of Fame goalie on their roster, especially one who’s closer to 40 years old than 30. So the conundrum the club is facing is what to do with its King? Despite his age, the Rangers could still receive a handsome return for Lundqvist in a trade, especially with netminders around the league dropping like flies with injuries. They could also keep him to mentor the young goalies in the organization such as Olof Lindbom, Tyler Wall, Igor Shesterkin and Adam Huska. Since the Rangers are rebuilding it means most players’ names have been mentioned as trade bait and this includes Lundqvist. Some fans believe the team would be doing a favor by shipping him out of town since he may have a chance to win a Stanley Cup elsewhere before retiring. There’s nothing wrong with that, but it’s all up to the player as Lundqvist’s contract contains a no-movement clause. We’ve seen different scenarios regarding star players in the past. Hall of Fame defenseman Ray Bourque had no problem being moved from the Boston Bruins near the end of his career after nearly two decades and ended up winning the Stanley Cup with the Colorado Avalanche. On the other hand, Mats Sundin of the Toronto Maple Leafs refused to waive his no-movement option prior to the 2008 trade deadline even though he was set to become an unrestricted free agent a few months later. Sundin, who was 37-years-old, didn’t like the idea of being a rental player with a cup contender. The Leafs were brutal at the time and rebuilding yet again so had asked their captain to waive the clause. They could have hauled in a couple of solid NHL players and high draft picks or prospects at the time had Sundin agreed to a move. Some fans went ballistic as they felt Sundin’s actions were selfish and obviously not in the best interest of the club. About 10 months later he signed with the Vancouver Canucks and the Leafs didn’t receive a thing for the Hall of Famer. Even though Lundqvist isn’t about to become a free agent, his situation is somewhat similar to his fellow countryman Sundin’s since he could help his club by agreeing to a trade. But the longer he stays with the Rangers the less valuable he may become. This is mainly because Lundqvist’s stats are betraying his age. It could be argued that the last time the highly-decorated goalie was at his best was back in 2014/15 when he posted a goals-against average of 2.25 with a 92.2 save percentage and five shutouts. The Rangers enjoyed a franchise-record season and finished atop the NHL standings. The team just missed reaching the Stanley Cup Final for the second year running as they were downed in seven games by the Tampa Bay Lightning in the Eastern Conference Final. Since that season, Lundqvist’s GAA has risen every year and hit a career-worst 2.98 in 2017/18. He’s currently at 2.93 this campaign with a career-low 90.8 save percentage while his overall NHL averages are 2.39 and 91.9 respectively. It’s obvious his stats have suffered since the team is rebuilding, but it’s also interesting to note he played just 46 regular-season games in 2014/15. Perhaps the key to keeping Lundqvist at his best is by playing him about 40 games a season and sharing the workload in net with Alexander Georgiev or Marek Mazanec. If Lundqvist could be persuaded to agree to a trade this year he’d probably be shipped out in a package deal with another veteran or two such as Mats Zuccarello, Marc Staal and/or Kevin Hayes. The Rangers would be looking for young established players in return or prospects and draft picks and perhaps even another goalie. 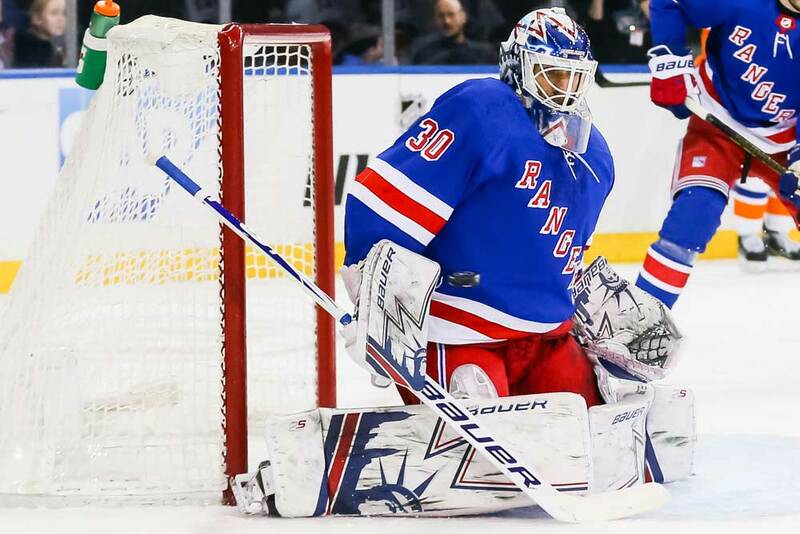 However, they may find teams unwilling to give up too much unless they view Lundqvist as somebody who could help them win a Stanley Cup within the next year or two. His $8.5 million salary-cap hit per season also needs to be considered. No matter what Lundqvist ultimately decides, he’s going to have his sweater hoisted to the Madison Square Garden rafters and be inducted into the Hockey Hall of Fame when he retires. He needs to realize the Rangers aren’t likely to challenge for a playoff spot again until after his contract’s expired though. If he agrees to a trade now he’d be killing two birds with one stone as he may have a shot at a Stanley Cup and also help out his beloved Rangers in the long run.